ROBYN'S FETISH CHALLENGE #289 "BABY CARDS"
Hello!! Today I am here to reveal 2 of the new 20 Digital Stamps that Robyn's Fetish Stamps and More Store has added. These are absolutely the cutest images for Christmas and Winter. You probably will want to have all of them by the time you get done seeing them. Each of our Design Team members were given two images and some took a couple more to make a variety of projects for you to see with these new images. The first image that I used is called "Peppermint." Who doesn't like those little peppermint candies? So, I made a Christmas Wreath with them. The total project is homemade. Here's a picture for you. Before I begin telling you about it. If you are wanting to do one of these make sure you have a little time to do one. I had the straw wreath for awhile and always wanted to make one of these. 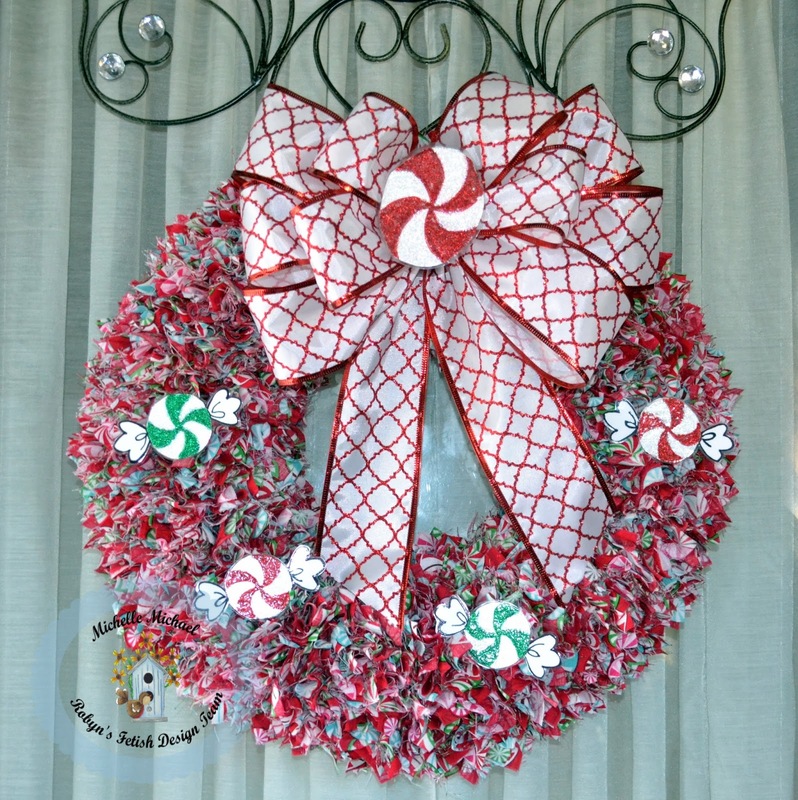 The material has peppermints all over it and is from Hobby Lobby. I cut and poked each square into the straw. I made the bow with Christmas Ribbon that had wire on each of the sides. The peppermints that are on the wreath are colored with glitter from Ranger. Then I laminated the peppermints so they wouldn't bend. I loved these peppermints. There were lots of projects I come up with but this was the one I wanted to tackle. 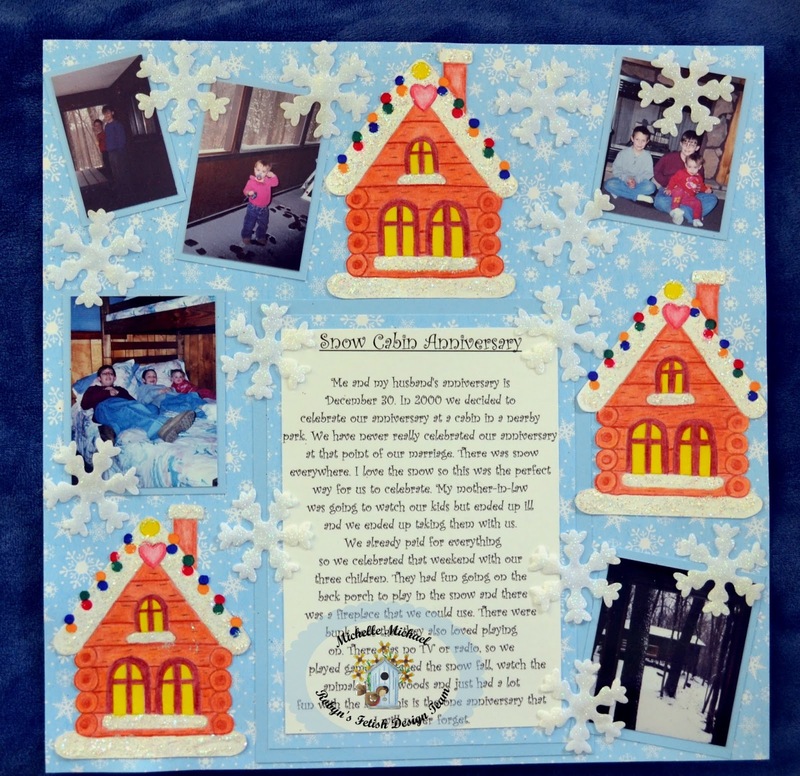 Then with the second image which is called "Snow Cabin" I made a Scrapbook Layout. This snow cabin is so cute with the Christmas lights and snow on the roof and window. When I seen this image I automatically knew I wanted to do a layout. One year my husband and I celebrated our anniversary in a cabin at a State park. Here's the layout with the story told on it. Those Cabins are adorable. As you can see I did make three of them to make sure the image stood out. Of course you see that my children are there and that's what made the story. I used Snowflake paper from The Paper Studio for the background. All the glittered snowflakes are from Make It Christmas. I colored the cabins and all the white you see on them are glitter from Ranger. The font that I used for the story is Curlz MT. I do hope that you enjoyed my projects and will love the rest of the Design Teams projects. So, to see all the new 20 Digital Images just go to Robyn's Fetish Digital Stamps and More. You won't be disappointed. Wonderful projects Michelle, love the wreath, and a great scrapbook page with the cabin.